Traditional Gospel with a twist is what this new single brings to its listeners. The song vibe is lively, inspirational and happy. Carol finally let her voice soar when she joined the church choir “Spirit Wings” and began shining as a soloist. Not taking her singing seriously at first, Carol thought she was just “having fun on the back row”. 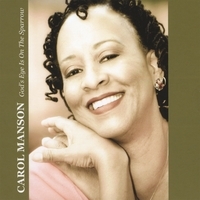 Then stepping out in faith, and surrendering to the Holy Spirit, Carol’s journey led to her first CD recording - All Is Well – which includes her hit single God’s Eye Is On The Sparrow. Carol’s other singing credits include; being a part of the cast for the musical Hallelujah City. Carol is married to Bush Manson and is the mother of son, Mark and step-sons Monte and Al. Carol lives in Sacramento, California and is a social work consultant for two group homes for boys. She continues to sing in the choir and perform many genres of music as a soloist. Ceasar Davis is the arranger/producer of God’s Eye is On the Sparrow. In addition to his many musical talents, Ceasar has expertise in Digital Distribution. Among the back-up singers that make up the choir are Ann Roach, an extraordinary vocalist and recording artist and Celeste Williams, Carol’s sister and a member of the Elmer Lee Thomas Blues Revue. Musicians performing on the CD single include Jeff Tamilier, former guitarist with Tower of Power and Richard Brown, who has played with many performers including Vickie Winans, Sheila E., and Yolanda Adams. Carol is working now to debut her first full CD - All Is Well - expected to be released in the fall of 2008.